Do you use BAT and leash skills? While I’ve been separated from our two monsters this summer, I’ve been thinking a lot about my poor leash-handling skills and the need to approximate off-leash walks in our small (but busy) town when we return in August. We have a lot of training to do, and I am excited about the continued challenge of working with our leash-reactive shepherds. We have leash laws in my town and in our parks and on trails, so it will still be rare for our dogs to experience off-leash freedom, but I want to be able to simulate the experience of off-leash walking with them, as they are both leash reactive to other dogs. I started thinking about Grisha Stewart’s Behavior Adjustment Training (BAT) again after reading Patricia McConnell’s recent review of Stewart’s new book, BAT 2.0. I read Stewart’s first book, but I don’t think I really let the principles of BAT sink in. (Clearly, I didn’t, because I still have two leash-reactive dogs.) 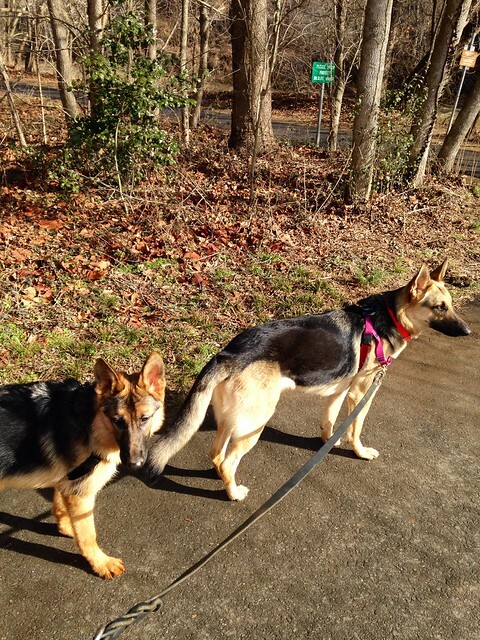 I was also grateful to find this recent post from Anne at All Dogs Are Smart, which is very helpful and includes some great videos on how to teach loose-leash walking (with harnesses) as well. I would like to apply some BAT leash-handling principles but also add a food reward. Our dogs are highly food motivated, and BAT often seems a bit too “mystical” for my taste (and I am not sure our dogs would discern any reward or positive reinforcement from some of its techniques, such as “mime pulling”). My husband walking Eden this past fall. Start working each dog, individually, on 15-foot leads (I like these biothane leashes from All K-9). The “individually” part is what is going to be a pain and be time-consuming, but it’s essential to work with them separately until they both have a handle on the new regime (and until I am totally up to speed with my new leash-handling skills). Start training inside, in the basement. Graduate to the backyard and then to the front walk, on up, over the weeks, until we are ready for a full walk. Implement rewards for sticking with me (and not pulling; looking at you, Eden), coming to my side when signaled, and ignoring triggers. Then, finally, try some walks in the real world! Do you use BAT techniques? How do you help your reactive dog on walks? Is a (relatively) leash-less life a key to well-adjusted dogs? 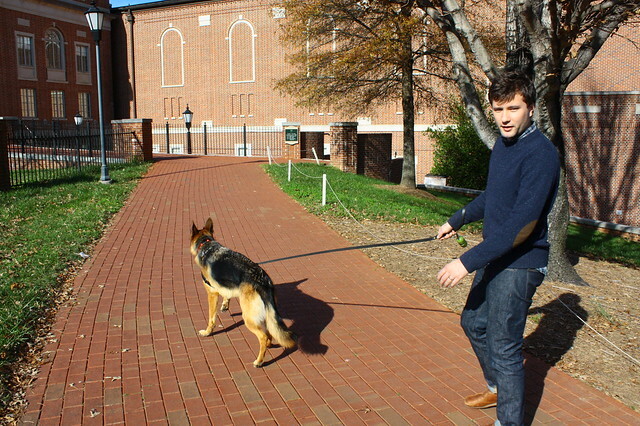 Previous postIs a (relatively) leash-less life a key to well-adjusted dogs? I’ve been using BAT for just over a year with my very anxious, very fearful Aussie, and it, combined with a thoughtfully applied medication (fluoexetine), changed our lives. I was quite skeptical of it at first – I had become quite well-versed in classical and counterconditioning, desensitization, operant conditioning, etc., and felt like this was a “voodoo” approach to these well-researched and proven protocols. What it showed me is that it really is just a different approach to offering those same benefits. The caveat to that is our BAT is somewhat adapted as well – we definitely incorporated food (and if you read 2.0, you’ll see that food is very much a part of the plan), but my problem wasn’t reactivity; Harper would either have a flight response or shut down completely. So for us, it wasn’t about getting Harper to move more calmly, it was about getting her to move AT ALL, and the biggest piece was me. BAT allowed me to stop trying to intervene for her, and allow her to figure a few things out herself, and once we got that down, things started gelling. While I don’t practice BAT as much as I used to (maybe only a couple times a month now), we still utilize certain cues. If I can see that Harper is frozen or stuck on a walk because of activity somewhere down the path, I can sit and wait a few seconds to allow her to assess the situation, read her stress signals and evaluate how close to threshold she is, and if I think she can handle it, give her the cue – ours ended up being “Are you ready?” or “Ready?” Now, when she hears that phrase/word, she’ll either look at me and stand still or start moving again. If she stays still, I’ve learned that by giving her just another second or two, she’ll then take a step all on her own and we’ll get moving again. Now, I have a new 3-yr old rescue Aussie as well (who’s deaf, which presents some of its own challenges), and he is SO friendly and SO excited to meet new friends, that I knew that if I didn’t get a handle on it quickly I would soon have a very frustrated greeter or a reactive dog on my hands. Some of the lessons I learned about handling in BAT has allowed me to give him the space and room to figure a few things out himself and calm himself down as well, and while I’ve only had him a month, he’s made some great progress in that area. The big takeaway for me is this: So long as you know how to read your dog and can gauge their threshold levels, put a little more trust in them and give them more space/time/room to make a good choice for themselves, and then reward that with a treat party, even for the smallest things in the beginning, and that’s where the classical/counter conditioning comes in. I wasn’t an anxious mess with Harper, but I was constantly trying to make things better for her IMMEDIATELY instead of letting that little Aussie smarty-pants figure some things out herself. I’m so glad you’ve been blogging while in the UK! I can’t wait to see what progress you make with Pyrrha and Eden when you return. And if you ever want to email/chat more about nerdy dog training techniques and trainers and the ilk, just give me a holler. I love this stuff. Thanks so much, Kelsey! It’s great to hear your experience and the progress you made with Harper through BAT. Very encouraging indeed! Keep up the good work!